If The Hate U Give helped you find your voice, now it’s time to make some noise! American author Angie Thomas kicked down the doors of the book world with her debut novel The Hate U Give in 2017. The rapper-turned-writer’s incendiary novel about state violence against African Americans, inspired by the Black Lives Matter movement, sold millions worldwide and was a number one bestseller on both sides of the Atlantic. It scooped a bevy of awards and was adapted into a stunning film in late 2018. Now Angie is back with an even more personal story and she’s coming to Edinburgh to share it with you. 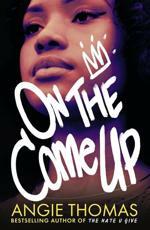 On the Come Up follows Bri, the teenage daughter of an underground hip hop legend who was gunned down before he made it big. Bri’s sights are set on being rap’s next superstar, but these dreams are threatened when her mum loses her job and poverty comes to clip Bri’s wings. When desire turns to desperation, what is Bri willing to become in order to salvage her dream and help her family? Join this inspiring new star of fiction as she sits down to chat with feminist poet Nadine Aisha Jassat, whose writing was featured in 2017’s hugely popular Nasty Women anthology. Hear about Angie’s own experiences as a teen rapper, the power of hip hop and the plight of child poverty in America, and how a far a dream can take you. You will get the chance to ask your own questions and Angie will be signing copies of her books after the event.